Danton Remoto - Danton Remoto was born on 25 March 1963 in Basa Air Base, Pampanga. He was an ASEAN scholar at the AdMU where he obtained his AB Interdisciplinary Studies in 1983. With his Robert Southwell scholarship, Remoto obtained his MA English Lit 1989; then, on a British Council fellowship, another MA in publishing studies, 1990, at the University of Stirling, Scotland.He was a Local fellow for poetry at the UP Creative Writing Center, 1994. He was at Hawthornden Castle, 1993, and later, at the Cambridge Seminar. Remoto teaches at AdMU where he manages the Office of Research and Publishing. He is also studying for his Ph.D. in creative writing at UP. 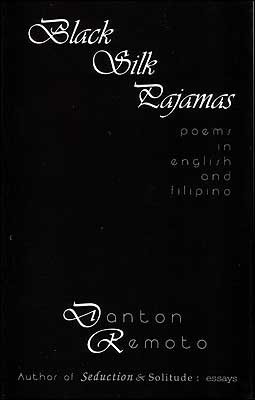 He was an associate of PLAC and a member of the Manila Critics Circle since 1989.He has won various awards, among them, the ASEAN prize for the essay, 1979; the Palanca for the essay in 1987; the CCP literary award for poetry; the Stirling District Arts Council award for poetry and the short story.Among his works: Skin , Voices , Faces , Anvil, 1991; Black Silk Pajamas / Poems in English and Filipino , Anvil, 1996. He edited Buena Vista [Alfrredo Navarro Salanga's poems and fiction], 1989 and co-ed Gems in Philippine Literature , 1989. More importantly, he has co-edited the Ladlad series with J. Neil Garcia.